The best way to buy silver from us is to call 800 889 2839 right after 8 AM Mountain Time for a quantity discount on volumes of 20 ounces or more. We can quote a price, and lock the price for five days, which gives you time to get the payment to us in a couple of days, and for us to get payment to our mint. 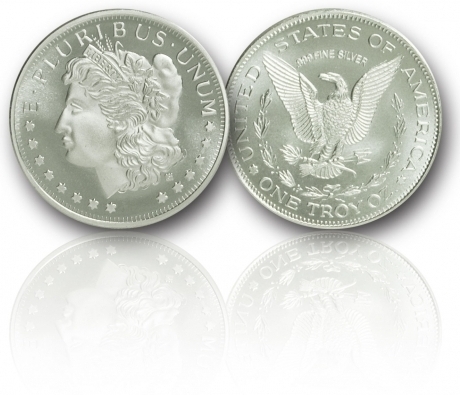 You can expect your silver within about 4 to 6 weeks, even if the mint has to make the order up from scratch. We ship via US Postal registered mail, and have never lost a shipment. Once we receive the invoice from the mint your price is locked on that order. 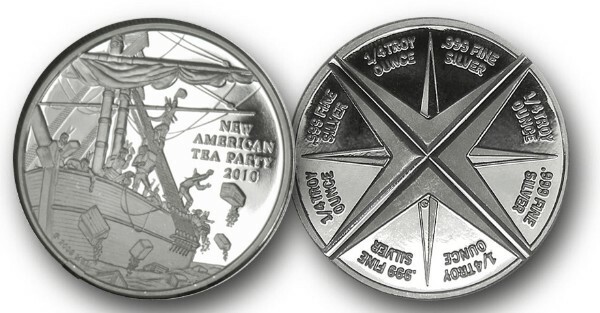 2010 Divisible American Tea Party Round..
We have our AMERICAN TEA PARTY 2010 commemorative medallion round available in 100 ounce minimum orders. 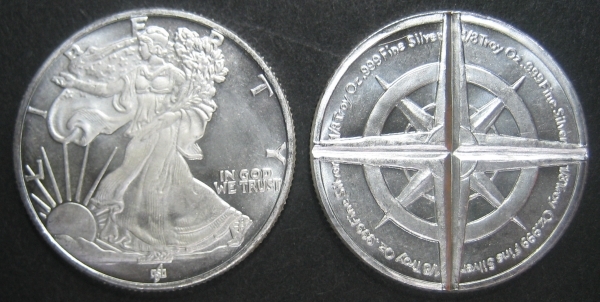 These new rounds are divisible into half or quarter ounce pieces when it's time for barter. 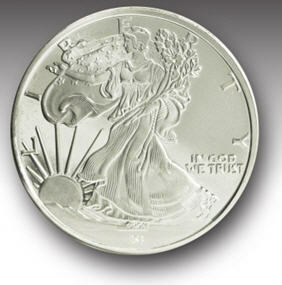 one troy ounce .999 fine silver medallion available only from us. 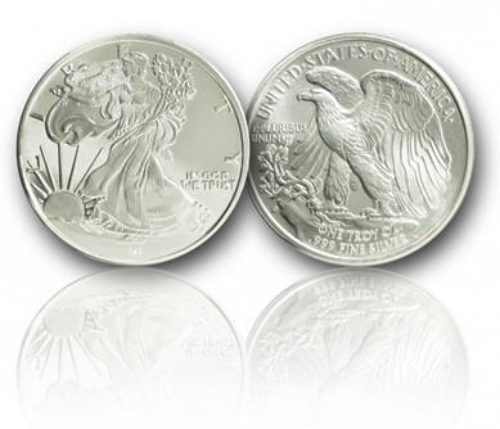 Don't miss these near proof quality one ounce silver rounds. 1/2 Troy Oz. Divisible Walking Liberty Round..
pieces for when things really get rough. 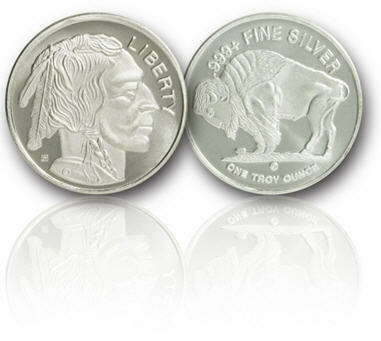 one half troy ounce .999 fine silver medallion . 1 Troy Oz. 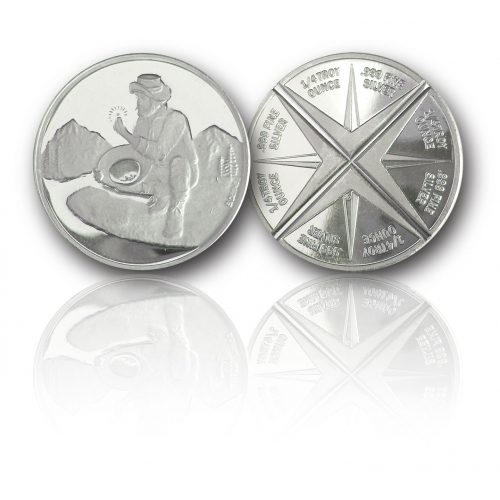 Divisible Alaska Prospector Round..
two bit pieces for when things really get rough. Call 800 889 2839 for price. This is a privately minted and one troy ounce .999 fine silver medallion . THIS IS OUR FASTEST SELLING PRODUCT. Call for discounts on quantity purchases. New Second Amendment copper medallion.. These are ready for immediate delivery at less than $4.00 per medallion. Tea Party Silver is excited to introduce our newest Copper medallion novelty item. In a time where our Rights are being compromised, it is important for us to stand together. One of those rights is clearly stated in the Second Amendment of the United States' Constitution, "A well regulated Militia, being necessary to the security of a free State, the right of the people to keep and bear Arms, shall not be infringed." That right is currently being "infringed" and concerned people worldwide are purchasing guns and ammunition at record numbers. Barrack Obama recently announced 23 Executive Orders that would restrict American's ability to buy and sell firearms. This Second Amendment Medallion is a commemorative piece minted in one ounce of high quality .999 fine copper. 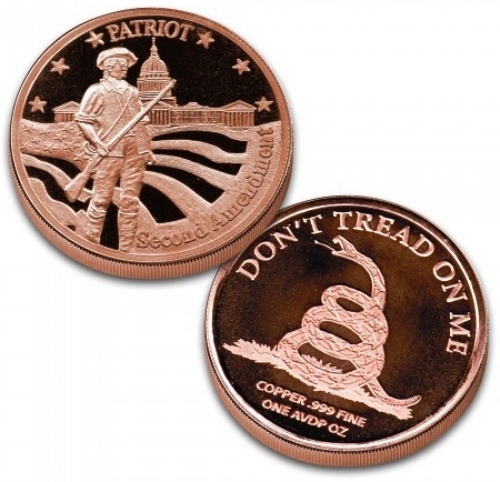 This Coin features the image of an American Patriot with Rifle in hand, standing in front of the Capital Building. The front reads in bold letters "Second Amendment" near the edge of the coin. The reverse of the medallion features a design called "Don't Tread on Me" derived from the Gadsden Flag, reminding Citizens to stand up for Gun Rights and protect the Second Amendment. Discounts for volume as below. Items below this line are special order only and will take about 6 weeks to get to you. tubes from the Mint, or in a plastic sheath when you order less than 20 coins. These are all exactly the same silver content at .999 fine, one troy ounce. Call 800 889 2839 for price. representative of what you actually receive, but know that they are all exactly the same silver content at .999 fine, one troy ounce. to do a little work and invest a little time in showing others how to get their silver. If you want the details on how to get your silver for less than spot price, just call me without charge at 800 889 2839.